Coast Guard Capt. Charlene Downey, Sector Los Angeles-Long Beach commanding officer, spoke of the accomplishments that the Coast Guard Cutter Halibut crew attained while under the command of Lt. Matthew Hurtt at the Halibut's change-of-command ceremony, July 12, 2017, Marina del Rey, Calif. Lt. j.g. John M. Epperly relieved Lt. Matthew Hurt as Commanding Officer of the Halibut. U.S. Coast Guard Photo by Petty Officer 3rd Class DaVonte' Marrow. 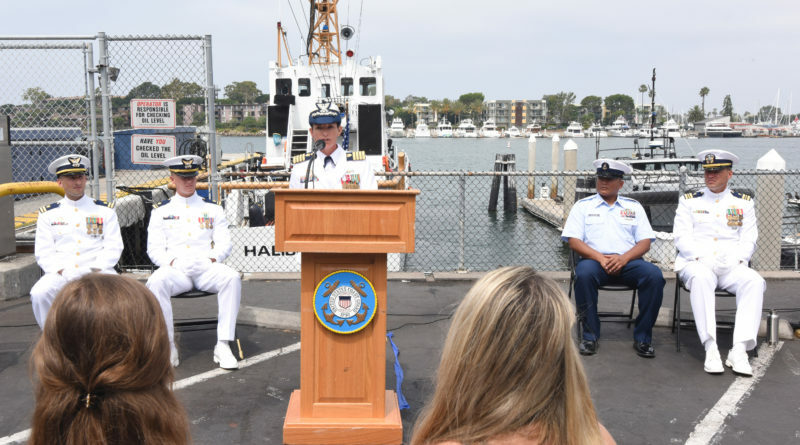 SAN PEDRO — The Coast Guard Cutter Halibut (WPB 87340) received a new commanding officer during a change-of-command ceremony in Marina del Rey, Wednesday. Lt. Matthew Hurt, commanding officer of the cutter Halibut, relinquished command to Lt. j.g. John M. Epperly during a time-honored military tradition that formally transfers and ensures the continuity of command. Epperly reports to the Halibut from his previous tour serving as the operations officer aboard the Coast Guard Cutter Wrangell (WPB 1332), a 110- foot patrol boat, one of six forward deployed U.S. Coast guard patrol boats supporting Operation Enduring Freedom in the Arabian Gulf. The Coast Guard Cutter Halibut is a Marine Protector Class coastal patrol cutter and is home-ported in Marina del Rey. The Halibut is known throughout the Coast Guard as “the Hollywood cutter” because of its close proximity to Los Angeles and is often used as a representation of the Coast Guard in many news broadcasts, television shows and movie productions.